I’ve been collecting these. Interesting movie facts that are often buried deep in an article, usually in a throwaway line that provides more food for thought than the article itself. Here we go. – John Carpenter was offered the job of directing ‘Top Gun’. He turned it down. – Arnold Schwarzenegger has won a Golden Globe for acting. – How many times has a Canadian been nominated for the Best Actor Oscar in the last 60 years? Once. – ‘The Shining’ was nominated for two Razzies in 1980. Including worst director. – Steven Seagal once broke Sean Connery’s wrist. – After ‘Jaws’ and ‘Close Encounters of the Third Kind’, Steven Spielberg desperately wanted to direct a James Bond film. He approached the producers. They said no. – Kiefer Sutherland has a twin sister, who looks just like him but with lipstick on. – River Pheonix’s real name was River Bottom. Ice-T’s first name is Tracy. John Wayne’s was Marion. – If you take into account inflation in ticket price, ‘Tootsie’ made more than ‘Harry Potter and the Sorcerer’s Stone’. ‘Blazing Saddles’ made double the amount of ‘Terminator 2’. And ‘American Graffiti’ made more than ‘Pirates of the Caribbean: Dead Man’s Chest’. – NASA keeps ‘So I Married An Axe Murderer’ on the Space Station. Add any interesting movie facts of your own in the comments. Leonardo DiCaprio was considered for Robin in Batman Forever. David Lynch was offered Return of the Jedi. Who was the above mentioned Canadian ? For what did Arnie win a Golden Globe ? Canadian – Ryan Gosling (‘Half Nelson’). This is hysterical! (And very humorous that you knew about this movie.) Thank you. Unbelievable acting…he got a globe for that….dear God. OJ Simpson was considered for the Terminator. O.J. Simpson went ‘Terminator’ on his wife and her friend. Allegedly. Has anyone ever seen Keifer and his sister together at the same time? Anybody that has played a lot of golf in the summer or hot weather knows that the kid glove used by golfers gets perspiration on it and becomes soaked , and if left becomes hard and almost shrinks so that you can’t put it on the next time unless you really work at it. So if it doesn’t fit he’s full of sh__. I love these lists, any useless random facts are always welcome. And am i alone in thinking in that movie Arnie deserved his globe? Jane Fonda turned down the role of the title character in Norma Rae and the role of Chris MacNeil in The Exorcist. Hollywood must have forgotten the rules. Spielberg can do whatever the hell he wants. Will Smith was offered the roll of NEO in THE MATRIX and turned it down. Debra Winger did NOT do the voice of E.T. Debra Winger did the temp track for E.T. which was partially-retained in the movie. Pat Welsh did the rest. 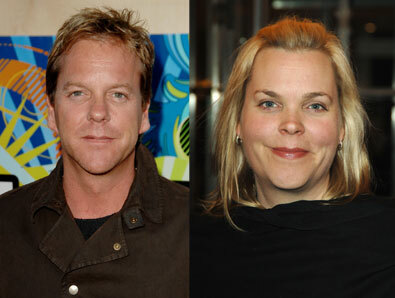 Kiefer Sutherland and his “twin” sister look nothing alike.